The Post received its charter shortly after the ending of World War I. The first Post Commander was Joseph Burke in 1920. It was a tradition to name the Legion Post after the town’s FIRST Fallen Comrade of the World War (WWI). 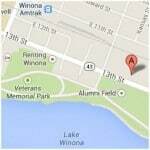 Use the Winona Area Veteran’s Center for your next venue! Check out the 99th Post Birthday Dinner coming up on April, 6, 2019. 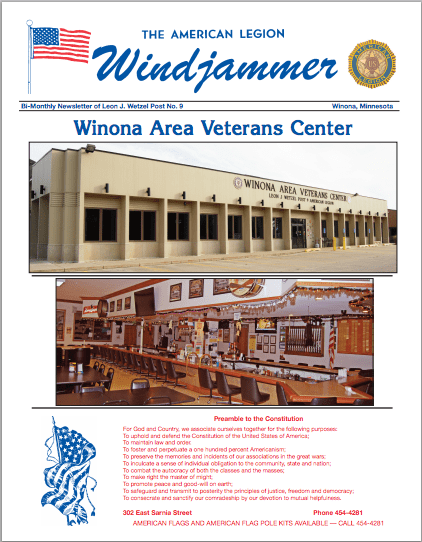 More information is posted in the Bar. The new E-tabs are here!!!! Try them out. They are really fun to play. Who knows, you could be the next big winner!!!!! 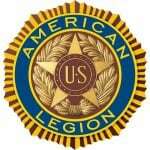 The American Legion Post 9 SAL has donated a new popcorn machine to the Post bar! The next time you meet an SAL member, THANK them for this effort. The popcorn from the new popcorn machine tastes great!!!! Thank you!!!! !